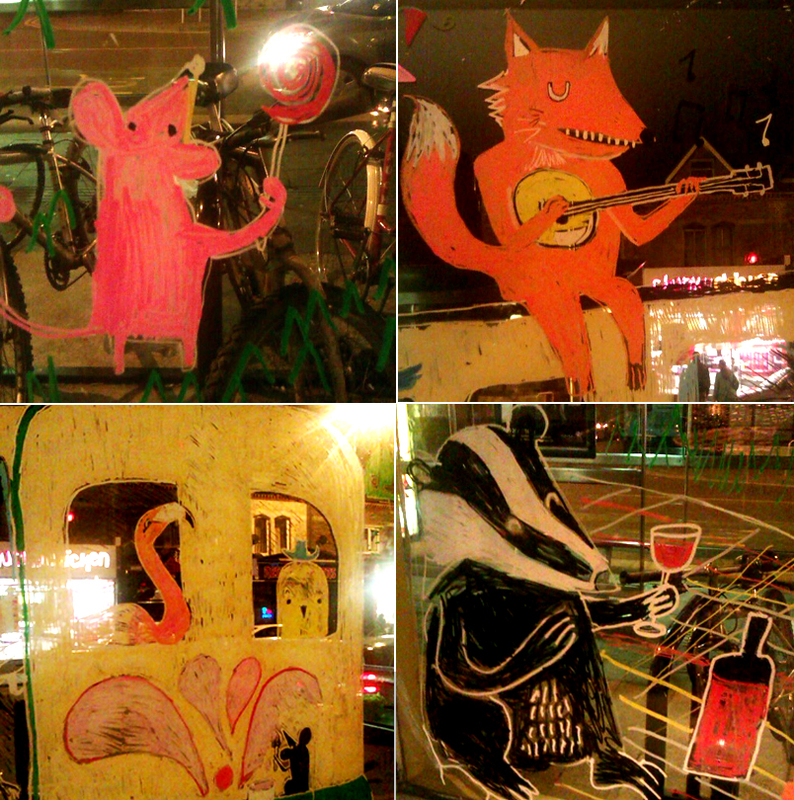 I was recently asked by Cardiff’s Milgi Lounge to draw on their front window. Every few weeks they invite an illustrator to create an eye catching mural to grab the attention of punters, passers-by and drivers waiting for the lights to change at the junction. 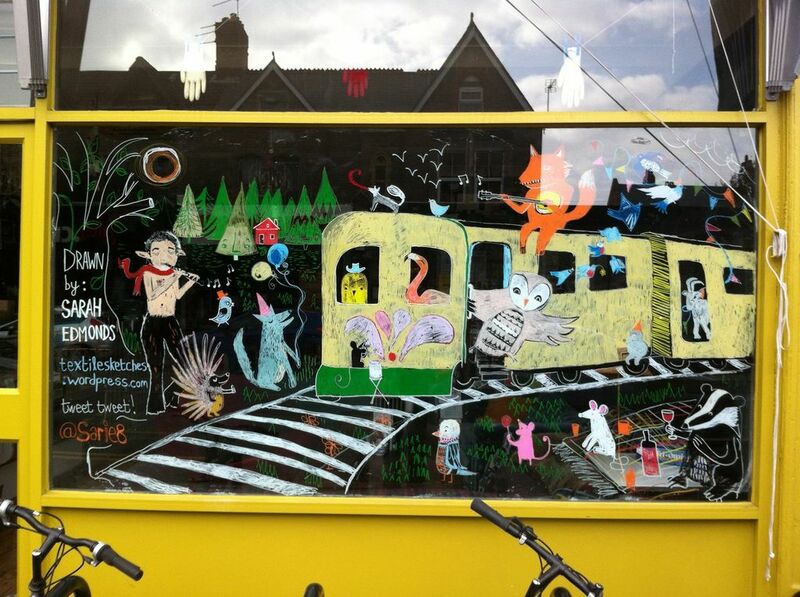 My drawing coincides with Roath’s Made in Spring Festival. 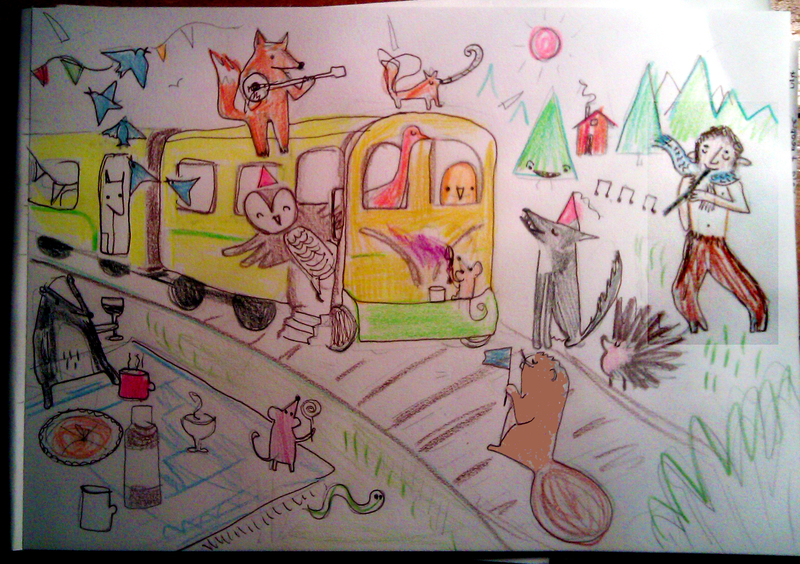 Inspired by my recent trip to Sweden (in which we travelled over 1000 kilometres by train from Stockholm to the Arctic), and the film The Darjeeling Limited, I decided on a train which had been taken over by a gang of jovial animals. The picture of James McAvoy on my fridge may have influenced a certain Mr. Tumnus the faun also joining in the fun. These photos show inspiration, planning, details and then the finished mural. Go and visit it in the next fortnight or so if you’re in the area! 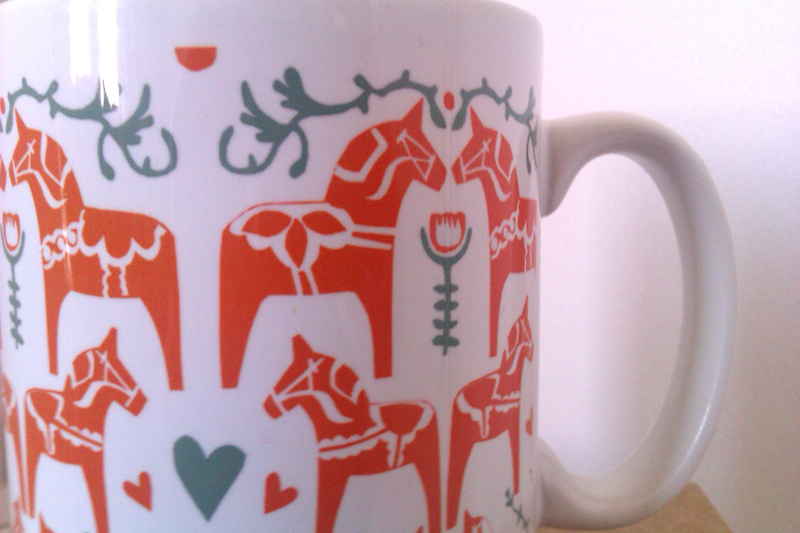 Following a successful launch day at the Art Carbootique, the Dala Horse mugs are now available to buy online. In bright orange and teal, they are a cheery addition to your kitchen, desk and coffee table. £7.00 + p&p: click here to visit my e-shop. 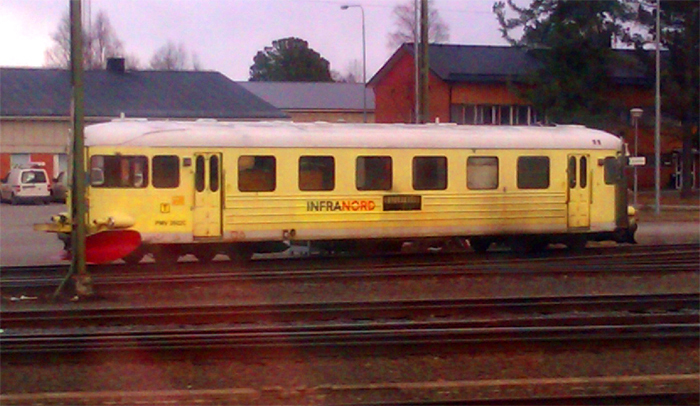 Next up – drawings and photographs from Sweden. This Sunday I will be having a stall at the Art Car Bootique at Chapter Arts Centre in Cardiff. 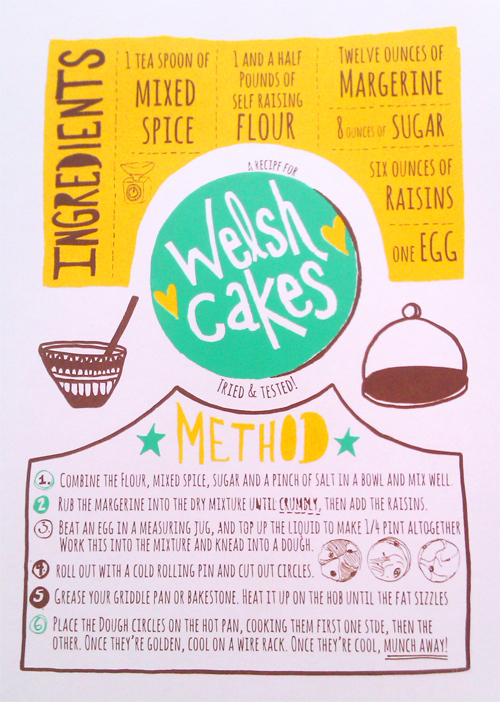 Following the popularity of the first edition, I’ve created a new colourway of the Recipe for Welshcakes. The second addition boasts Welsh colours, daffodil spring-bright colours! These will be available at the market too, alongside the last few prints from the first edition batch. Vote for the Dala Horses! Those of you who know me are aware of my Nordic influences, and the cold weather has inspired several new designs. I’m currently developing another decorative piece like the Swedish / Dala Horses, but this time featuring hares, cabins and midnight suns. I’ll put it up early next week for all to see. A dish running away with a spoon, nose-stealing blackbirds and a present-eating tree are also at various stages on the living room table. More soon, promise. 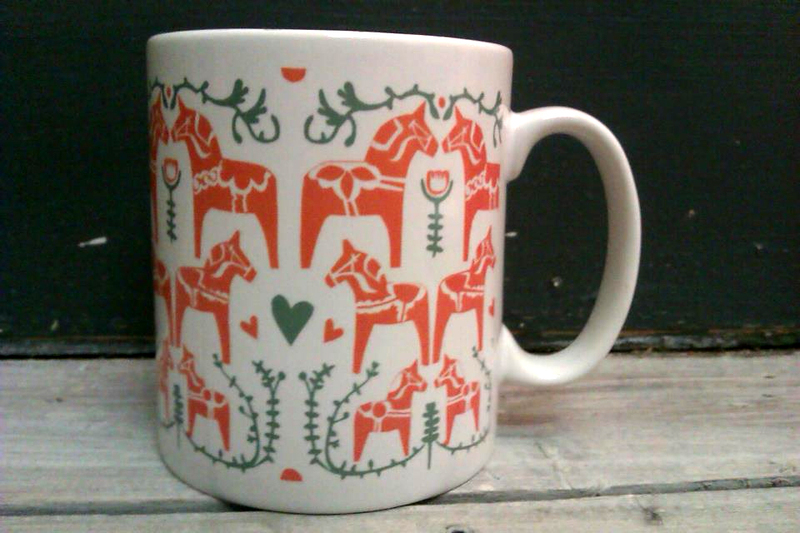 Meanwhile, I recently entered my Dala horses design (above) into the Pedlars Product of the Month mug competition. The winning design will be made into a mug, and from the sale of each mug £1 will go to a charity of the designer’s choice. If I were lucky enough to be successful, the charity I’d choose would be St David’s Foundation Hospice Care. 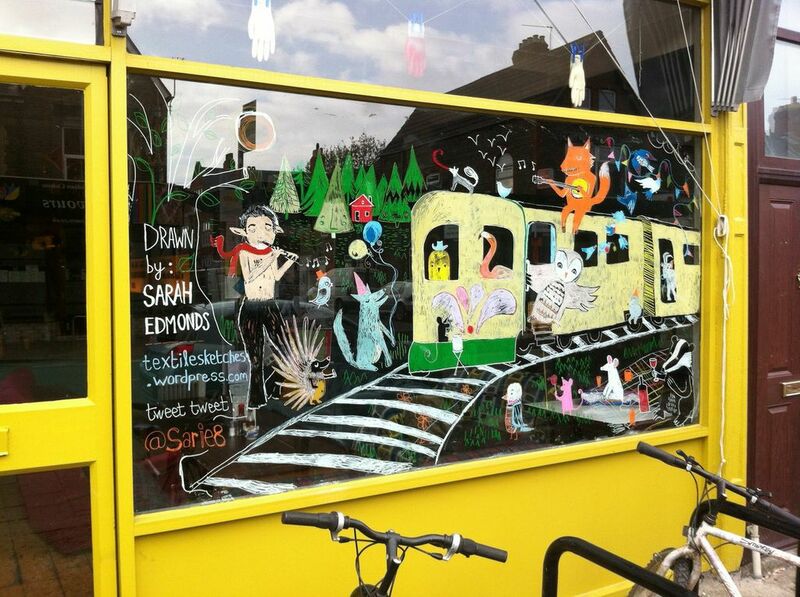 I’d love to get my work out there to new audiences / independent stores like Pedlars. So I need you to vote for my design! I Voting ends on Dec 10th so make sure you get in there in time. Please feel free to pass this on to your friends/contacts who may want to vote too.